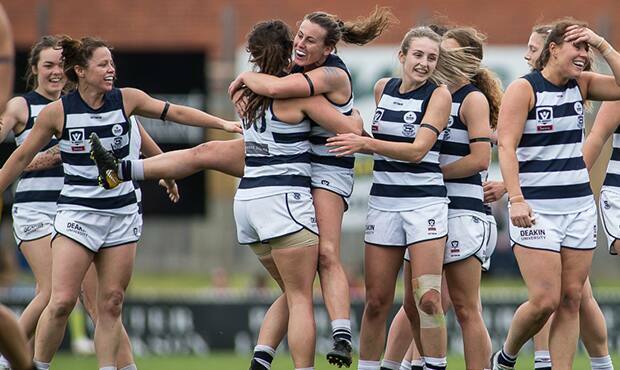 Geelong’s VFLW side has won its first ever final, defeating the NT Thunder 7.9 (51) to 6.6 (42) in a come from behind thriller. Both sides contested hard from the start in a fast-paced game, as the NT Thunder managed to lock the ball in their forward half despite the pressure applied by Geelong to establish a nine point lead at the first break. The Cats managed to kick two successive goals through Rocky Cranston and Olivia Purcell in the second quarter, but three majors to the Thunder opened up their 15 point lead at half time. It was Geelong’s stunning third quarter that brought the crowd to their feet, as Hannah Burchell booted two goals and Danielle Orr kicked one to narrow the Thunder’s lead to just one point at the final break. A beautiful team passage of play sealed with a goal from Mia-Rae Clifford saw the Cats hit the lead with seven minutes left in the final quarter. Geelong made sure to apply pressure until the final siren, going on to claim victory and a preliminary final berth against Collingwood next week. Geelong VFLW coach Paul Hood said that it was his side’s belief in one another that ensured the close victory. “It was a great lift for the players to know that they could really trust their teammates and just play their role each and they did that really well,” he said. “It was probably the strongest team that we’ve ever put out. Hood praised the team’s ability to adapt to the conditions and said that the win was a reward for the commitment that each player has put in. “The wind was difficult to get the game going. NT did a great job to score early and make it hard for us,” he said. “But we also felt all the way through that they’ve (NT) had a lot of travel they needed to make and they’ve had two weeks off before this game. It’s certainly something that we hung our hat on and the girls showed some great belief to run over them. Geelong Falcons star Nina Morrison was named as the Cats’ best. “She was outstanding on the wing, just her ability to get up and down the ground, but then her composure with the ball too was terrific,” Hood said. There were multiple standout players across the ground. “Anna Teague down back had a terrific game and took some big marks and was really hard to play on again,” Hood said. “Richelle Cranston was everywhere and had two goals. When we needed a goal early she provided one to get us back in the game, and that booming kick late were some things that only some people can do. Hood was also pleased with the way that his players were able to adapt to different roles when needed. “We needed to change a little bit with Erin (Hoare) going down. Erin’s got a little foot injury that we’ll check up on during the week but ruled her out for today. Kate Darby going into the ruck was vital for us,” he said. The Cats now progress to a Preliminary Final against Collingwood, who they drew with in round two. “It’s set up pretty well isn’t it, it was a fierce contest that game and ended in a draw so this one’s a great rematch and we look forward to bringing it next week,” Hood said. The VFLW Cats will face Collingwood next Sunday at Stannards Stadium (North Port Oval).